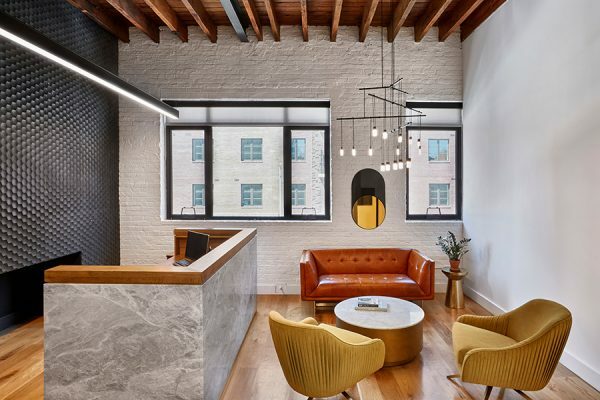 Our friends at the Brooklyn-based architecture firm StudiosC, who have, in recent years, undertaken a bevy of adaptive reuse project, have undertaken their latest in the form of the transformation of an neglected Williamsburg loft into a workspace for a boutique law firm. The 3,K SqFt office features abundant natural light and a restored timber-frame ceiling; with the addition of custom furniture, the firm sought to create a meaningful dialogue between design of the past, specifically of the loft, and that of the present: a relaxed, warm-hued environment for a boutique law firm. The addition of a concrete-and-steel roof deck which serves as a gathering place for employees and visitors is connected to the main office by a central corridor. Says StudiosC principal Stephen Conte, “Office design has to transcend just workstations and start to build a sense of comfort and community.” Restoring elements of the original loft was also a method of reducing waste, as well as paying homage to 20th century loft-craftsmanship: the firm sought to incorporate elements of the existing building’s structure wherever possible. One Hundred East Fifty Third is an extremely slender residential skyscraper in Midtown, designed by our friends at Foster + Partners, rising in close proximity the 1958 Seagram Building of Mies van der Rohe. It stands 63-storeys, contains 94 residential units, and is visually distinctive for its undulant exterior of transparent and white ribbed glass. Foster has also designed the building’s extensive amenities suite, which include a 60′ swimming pool surrounded by distinctive curvilinear windows and screens of slatted oak, of which the latter are also utilized in abutting changing areas which feature rain showers. Black granite figures into the tiling around the pool as well as steps leading down to an abutting lounge, and a staircase links this program to a glassy gymnasium. Additionally, the building’s lobby features a fluted Calacatta marble wall. 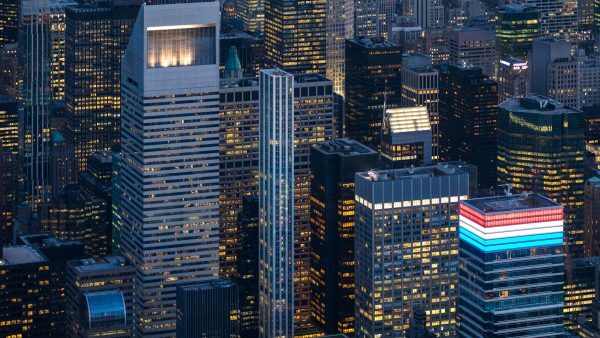 William T Georgis, principal among our friends at William T Georgis Architect, has designed two setups at the development as well as a pair of model apartments on the building’s 36th floor.